Street Fighter 2, Boxing and Karate, Dogfight Aerial Combat, Hand-to-Hand Battles, Medieval Fighting Games. Embark on a new adventure with Matt, Natalie and Lance and help them regain their stolen powers. Spear, slice, and kick severed heads at your enemies in this fighting game. You can pick up spears from fallen enemies. Help grandpa fight all the scum bags in his neighborhood and earn money in this fighting game. Train to become a skilled stickman fighter and defeat other stickmen. Play story mode, or vs mode. Battle to become the highest ranking fighter and uncover the emperor's spy in this RPG fighting game. 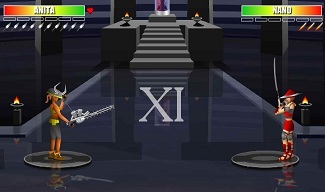 Face new enemies, new bosses, and utilize new moves in this platform samurai sword fighting game. Capcom has released the complete Street Fighter 2 CE as a free Flash port. 15 new scenarios to battle your way through this fast paced fighting game. Fight in a street brawl or choose to fight in a gang war where you will fight rival gang members and build up your character. The Emperor Arena fighting game: Choose between a warrior, mage, or charmer and compete in the battle arena. Play through numerous missions while gaining experience, weapons, abilities and additional warriors. Amazing fighting game which includes 6 starting characters and 5 unlockable characters. Turn based strategy game. Customize your mech and compete in battle against computer controlled opponents. Bloody Rage was a great attempt at making a fun and fast (Mortal Kombat type) fighting game for the Flash platform. Play through numerous missions while gaining experience, new weapons, new abilities and additional warriors. Be champion of the Dragon Fist Arena in this martial arts fighting game. Each character has different weapons. Choose a character and fight in a desert, ship, or alien setting, but be careful not to fall off the sides. Stickman fighting game. Combine martial arts, street fighting, and super-stickman powers. Train your monster to win fighting championships and become the Grand Mater of monster training. A polished fighting game that contains many of the cool features found in the old arcade 2D fighting games. Throw shirukens and slice enemies to pieces on your way to victory in this fast paced ninja fighting game. Remake of the classic arcade game Karate Blazers. Fight for your life in this double dragon style fighing game. Collect gold and purchase new weapons to fight foes and upgrade your character. Plane game pits you against computer controlled enemies in a campaign consisting of several missions. Final Fantasy style fighting system with lots of unique attacks and abilities available. Travel across the world to defeat your opponents and become the ultimate prizefighting champion. Awesome 1 or 2 player plane flying action. Single player mode contains a number of missions to progress through. Khronos is a violent sidescroller which requires the player to hack and slash their enemies using combination attacks.